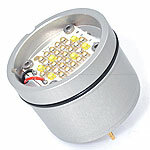 The CYAN LED module provides a very high output of 5,000 lumens. The spectrum of this light exactly matches the ambient light at a depth of 15-20m. This light is designed to be used when the camera is white balanced to ambient light at moderate depth range.